If proof were needed that Roydon Common, the Norfolk Wildlife Trust owned reserve near King’s Lynn is a wild plant lovers’ paradise, it was provided today. I was among a party from the Gaywood Valley Conservation Group enjoying a three-hour wander over the heathland this morning to learn more about the multitude of plants. In August, the reserve develops a purple hue because of the large spread of heather – two of the three British types are found here, cross-leaved and common. Flowers across the reserve were all displaying their bright and cheery colours to the full in the sunshine. There are hundreds of different plants around the 365-hectare site, from the humble daisy to marsh bedstraw, greater birdsfoot trefoil, fleabane, bog asphodel and carnivorous sundews. 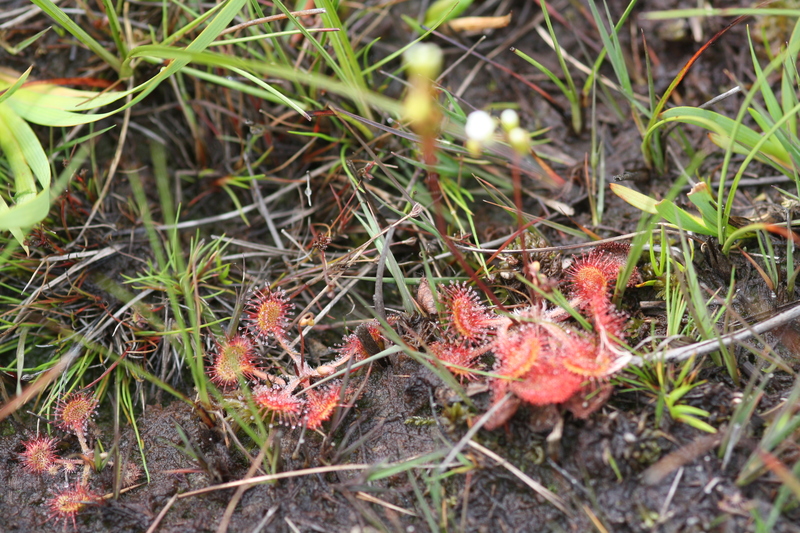 There are three species of sundew in Britain, the round-leaved, the oblong-leaved and the great and they can all be found in the wet, boggy areas of the Common. As their environment is acidic, these plants cannot extract a sufficient amount of nutrients and so they use the sticky, sweet smelling droplets on the ends of their hairy leaves to lure small insects which they then digest, to boost their survival. The round-leaved sundews were today displaying their tiny white flowers atop long stems, and, as that is, according to my wild flower book by Simon Harrap,something which only happens in sunshine and then not very often, I guess we were very lucky to see them. Sadly, all my efforts to get a good photograph of the flowers failed, although there does appear to be a bud slowly stretching its way up ready to open in the picture below. Round-leaved sundews with the sticky droplets on their leaves. Boosting my knowledge of plants and trees will help me to track down suitable sites for things such as butterflies and birds. Thankfully, several members of the recently formed Conservation Group are much more knowledgeable than I am when it comes to plants! The stroll around Roydon Common was a pleasure in itself. Exercise, fresh air, and wide open spaces, which are not often encountered these days. The Common has several designations, a National Nature Reserve, a Special Area of Conservation, a Site of Special Scientific Interest and a Ramsar site (which means it is a wetland of international importance). 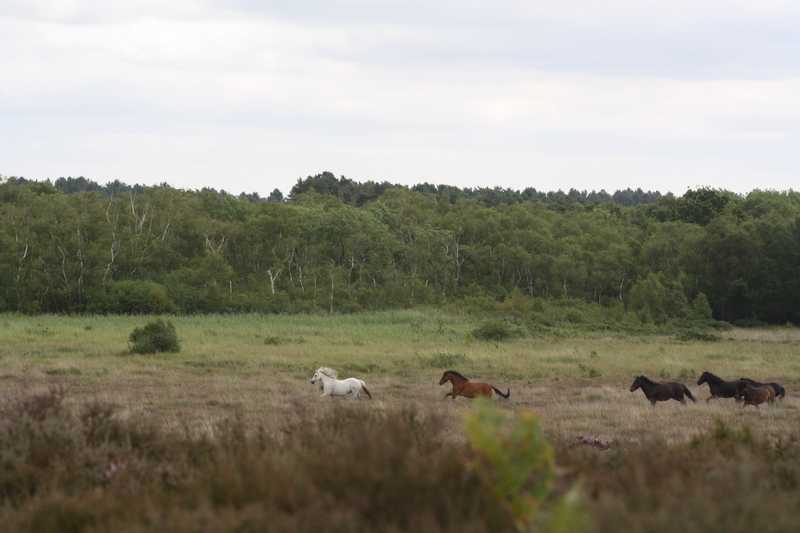 As such, it is one of the most important remaining areas of heathland in Norfolk. More than 80% of Norfolk’s heaths have been lost over the years, some having been ploughed up for agriculture, and others having been converted to conifer plantations. This latter fate happened to Grimston Warren, which lies next to Roydon Common. However, Norfolk Wildlife Trust took over the Warren and removed the trees to return it to its former state. The area includes dry and wet heath, fen and bog, acid grassland, carr and woodland as well as the route of a former railway line, all of which provide a varied selection of habitats and a very rich biodiversity. Other highlights of the morning included seeing a kestrel hunting over the heath, and sightings of butterflies and dragonflies, although the insects were possibly subdued by the stiff breeze. While we were studying the flora, the NWT grazing task force – a herd of Dartmoor ponies – was keeping a close eye on us, cantering out of our way if we got too close! Look out, people approaching. Time to fly!